I love the delicate colours in the pattern and the little raised dots. One is this gorgeous pastel flower pattern in a handpainted style which has tiny raised dots at the centre of the flowers. I don’t know what the pattern name is but it was made between 1927 and 1935 because it has the Crown China backstamp. It’s such a lovely example of early fine china – I had two of these tea sets and I hope their new owner in South Africa enjoys using them! I love that these patterns look really fresh and almost contemporary given that they’re about 80 years old! The Gossamer pattern is something quite different. A friend of mine contacted me recently to say that she had a few pieces of her grandmother’s china to give away and one of them was a blue cup, saucer and plate in a marbled pattern that I’d never seen before. Unfortunately the cup was damaged but I eagerly accepted the saucer and plate thinking I could make an unusual cake stand with them (which I’ve not got around to making yet!). Then coincidentally my mum found six tea sets in the same pattern and they’re all in immaculate condition, each in a different colour. The pattern was introduced by Royal Albert in 1950 and continued to be made in the 1960s / early 70s. The simple smooth shape suits the design really well. I love the variation in the patterns: each one is subtly different in what I’m assuming is a random way (although I’ve not yet found out exactly how the pattern was made). Anyone know? 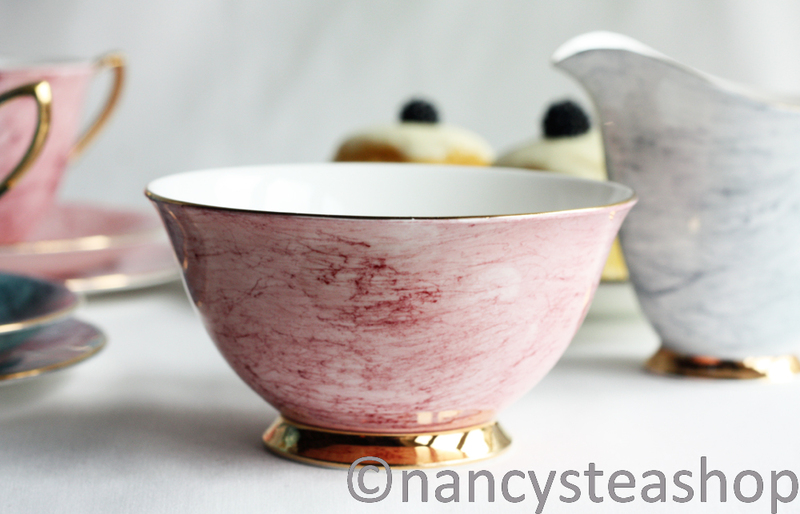 This pink sugar bowl and blue creamer/milk jug (in the background) match the tea cups. Surprisingly there doesn’t seem to have been a teapot made to match the set. I purchased an eclectic set of beautiful tea cups from an estate sale. Each set is unused. 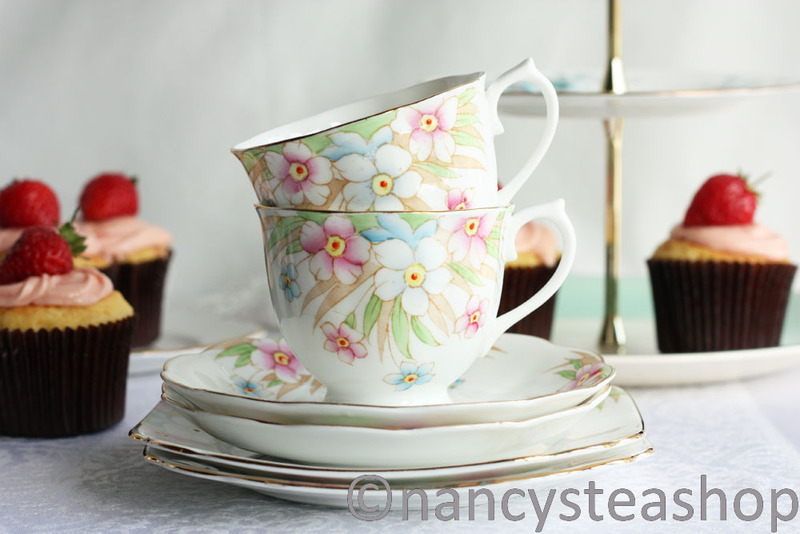 One of the sets is Royal Albert “Serena”. It has a crown china stamp on the bottom with a number 839329. I also have 2 Paragon tea cup sets with plain butterfly handles on them. 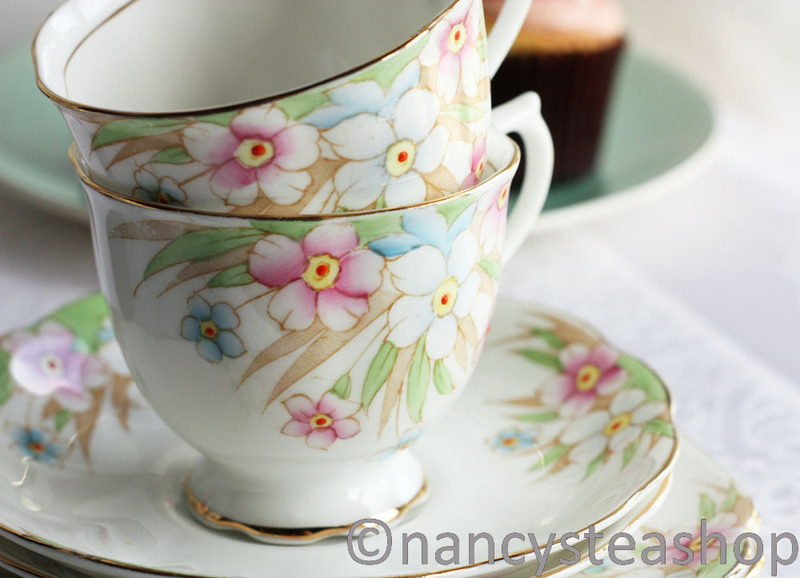 Hi – I just picked up a Serena teacup and saucer, but now I’m noticing there are two distinctive patterns on the teacup and am wondering about it. Online, I see designs where the inside of the cup has a narrow gold trim with a small floral design, and the outside of the cup has a wide floral design. My cup is the opposite – the wide floral design is on the inside, and the narrower design with smaller flowers is on the outside. I can’t find any information about this, and wonder if one design was an earlier one than the other. Do you know anything about it?